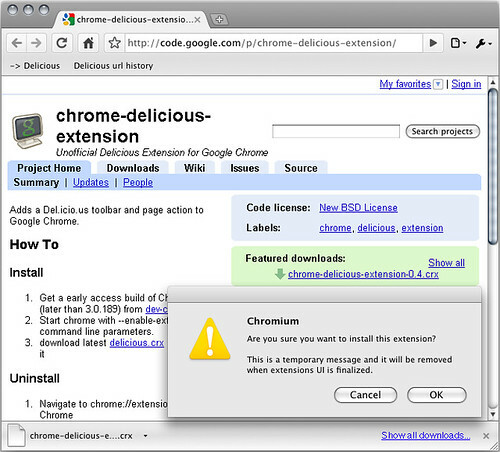 Since Mac Chromium 4.0.224.3 (29991) which was released on 23rd October 2009 it is possible to drag n’ drop urls into the Bookmarks Bar. p.s. Yes, I downloaded and tried out every build of that day to identify the exact one which has the feature enabled. The social aspect of Delicious has (finally) got a little boost. 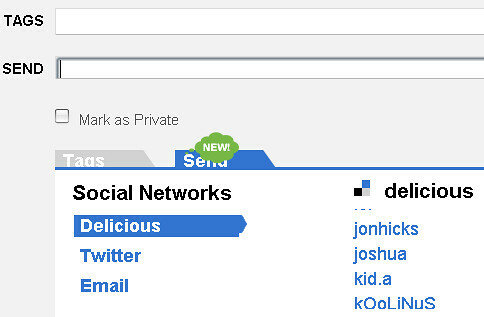 Now you can “send” bookmarks from Delicious not only to other users who are in your network but also as a message on Twitter and via e-mail. Here’s how the two options look like. To send a link to Twitter you have to login to your account. And here’s the e-mail forwarding. The form states that Delicious will remember and list e-mail addresses, in the same way it now does users from your network.